Our Colossal Winter Double XL can fit tall and active sleepers that are up to 6’8”. These are one of the largest sleeping bags ever designed for one person. End the day sleeping comfortably warm in a bag that’s more than extra wide and roomy. It's colossal. 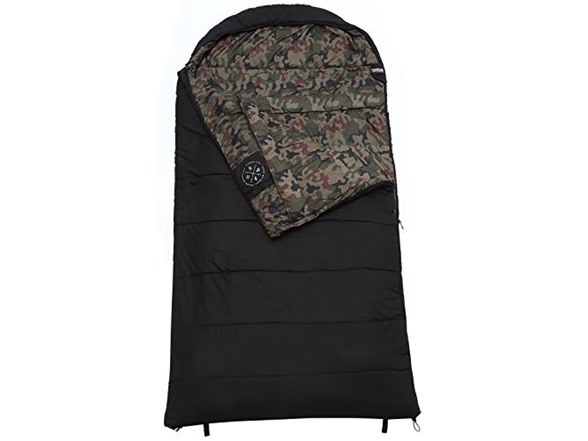 This long sleeping bag is one of the biggest and widest out there. Best for those who are prone to turn and toss at night or for people with bigger built. Easy stow-away: Can pack down to 19 x 14 x14 inches. Easily roll your bag up and tightly secure it with two way compression sack straps. 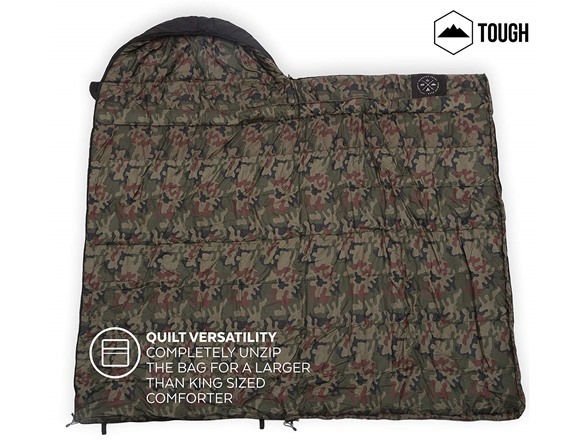 Constructed with a durable, ripstop water resistant shell, high-loft insulation and a soft, non-scratchy woven liner This sleeping bag has an extreme temperature minimum of 10°F. 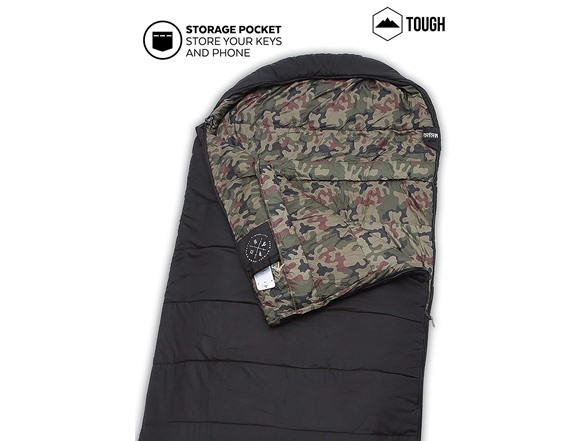 Safely store your keys and phone: Sleeping bag features an inner storage pocket, perfect for keeping your keys and phone accessible at alll times. 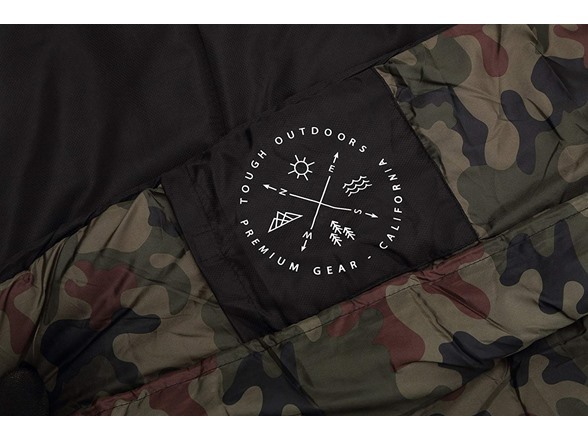 Sleeping Bag Dimensions: 90 x 45 in. Compression Sack Dimensions: 19 x 14 in. 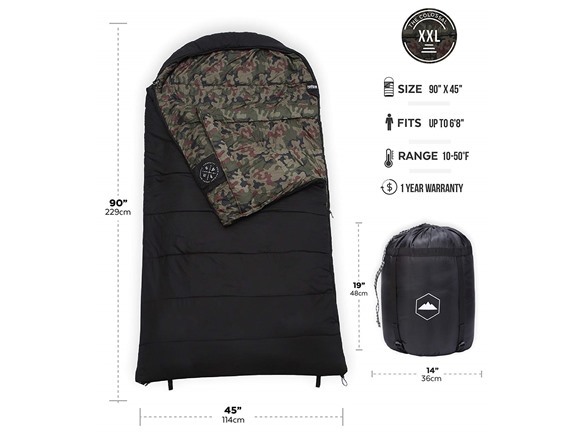 (1) Tough Outdoors Colossal Winter Sleeping Bag - XXL Hooded Sleeping Bag for Cold Weather - Perfect for Camping, Backpacking. Temperature Range 20-50°F. Fits Adults up to 6'8. 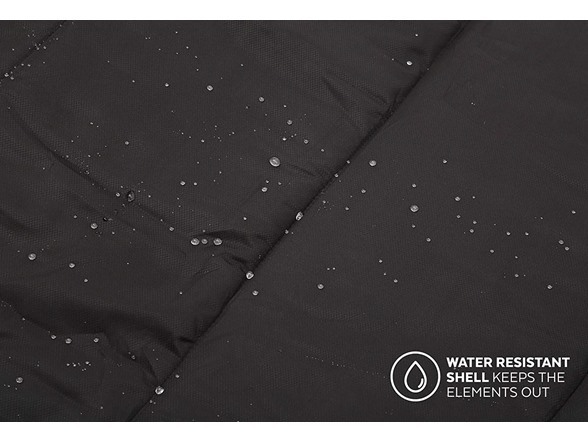 Ripstop Water Resistant Shell.